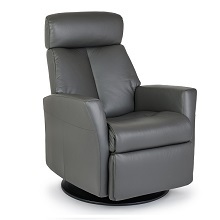 The Queen recliner is a multifunction chair that truly does it all - from swiveling and rocking to reclining, the Queen guarantees superior comfort by moving and shifting with the body and reclining with the pull of a lever. Further customize your comfort by adjusting the headrest to the desired height and position for full body support and alignment. Available in nature leather. 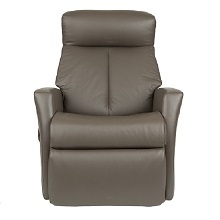 Available in additional colors in standard or large sizes with the option of manual or electric reclining mechanisms. Size: L 31"W 35"H 38/43"